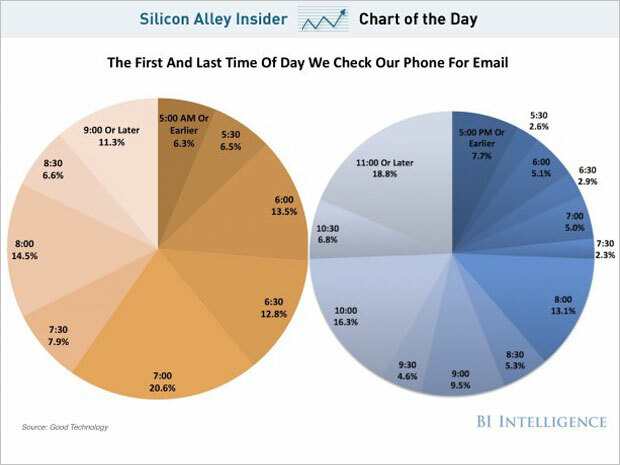 According to new data from Good Technology, nearly 60% of American’s surveyed check their email for the first time via mobile phone before 7AM (59.7%). On top of that, of the same people surveyed, 56% check their email for the last time after 9PM. Are we addicted to email? This survey, seems to indicate that we are. From my own experience, I can say that on most days, even before I’m out of bed I’ve already checked not only all of my email accounts, but all social media accounts, like Facebook, Instagram, and Twitter, as well. If most people are checking their email before 7AM, you will want to schedule your email campaigns well ahead of this. Schedule ahead of time so they will see it in the morning and not wait until they are in bed. Since social channels are easily consumed via mobile, experiment with scheduling social content in the wee hours. Be sure to track the results of your experiments so that you can adjust timing as needed. There are several tools available specifically for the best times to tweet by seeing when your followers are most active. Social Bro, Tweriod, and When To Tweet. Likewise, to really know when your email campaigns will be most effective (i.e., have a high click-through rate) testing and experimentation is needed. Even a well-crafted user survey could yield insightful data for your business. We need to disconnect more often and go play outside!